Unidentified blue blob sighted at Lush Gardens of Allentown! Lawn damage suspected! Garden serenity obliterated! Read more on page 7! Well, okay, it's not exactly unidentified. And since it is my goal to annihilate all lawn, I guess a big brown patch won't be the end of the world. 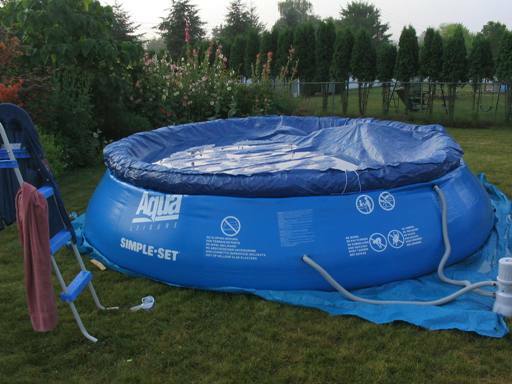 So we got one of the newest fad in swimming pools - the floating-ring magically erecting poly plastic contraption now found in 37% of all US yards. And guess what - so far we seem to be enjoying it. So if you spot some mysterious blue patches in newly posted plant photos - it's probably just a piece of pool. SPLASH!